I play around a lot with my USB flash drives. They’re useful for so many things beyond just transferring files between devices. 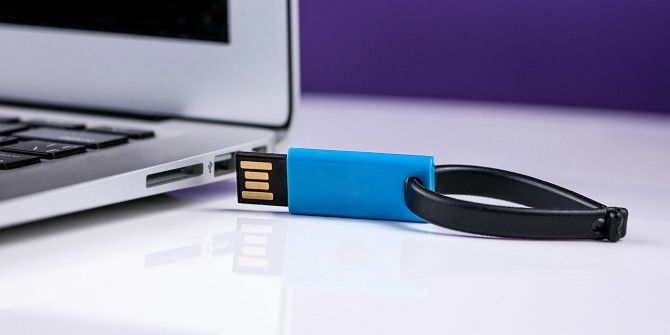 For example, you can use a USB drive to lock and unlock your computer as well as carry around portable apps everywhere you go Are USB Flash Drives Still Worth It In 2015? Are USB Flash Drives Still Worth It In 2015? USB flash drives are great for storage, but they have so many other uses. Here's how they're worth their weight in gold. Read More . As for me, I mostly use them as bootable drives for ISO files 10 Tools to Make a Bootable USB From an ISO File 10 Tools to Make a Bootable USB From an ISO File Installing an operating system from a USB drive is quick and portable. We test a few ISO to USB tools to find the best one for you. Read More , which comes in handy when I want to try new flavors of Linux or turn a bricked laptop back into a Windows machine. But I recently ran into a weird problem: I’m not sure how, but my 4 GB USB drive was suddenly showing up as a 100 MB USB drive. I’d lost a huge chunk of my drive’s storage capacity! Fortunately I found a fix, and if this has happened to you, rest assured that the fix is surprisingly simple. As it turns out, the USB drive’s partitions had been tampered with, leaving most of the drive “unallocated” and inaccessible. That’s likely what happened to your drive. To fix this, we’ll just reset the partitions on the drive and “reallocate” all of the space as a new, single partition. Before going ahead, back up your data! The following steps will completely wipe your drive. And make sure you pay attention to step 4 as you don’t want to accidentally wipe the wrong one! In the Start Menu, search for and launch diskpart. Type list disk to see all current disk volumes on your system. Plug in your USB drive and type list disk again. Note the newly listed volume. Type select disk # where # corresponds to your USB drive’s volume number. Type clean to wipe the volume of all partitions. Type create partition primary to make a new partition with all unallocated space. If done correctly, your USB drive should be back to normal: a single partition with all of the space on the drive properly allocated and used. No more lost space! Unable to reformat the drive? It might be write protected—here’s how to format a write-protected USB drive How to Format a Write Protected USB Flash Drive How to Format a Write Protected USB Flash Drive Came across a write protected flash drive? Here's how to format your write protected USB flash drive and start using it again. Read More . Explore more about: Troubleshooting, USB Drive, Windows Tricks. Hi, I found this post very informative. Thanks a lot. However, something is not clear to me, Im sorry this might be a noob question, but what happens to the contents of the USB after fixing it? I mean, did you reformat the flash drive before fixing it? The thing is, I wanna know beforehand, so that I can prepare my recovery tool which is Acethinker Disk Recovery before doing your process. Thanks in advance for your response. It was easy to follow and worked perfectly. This was a HUGE help. Thank you! Thanks a lot. Got back 100GB. Saved me a lot of money. It worked well, I have gained all the space 14.5 GB in 16 GB drive. Thanks. Saved my day. Thanks a ton! Whenever I make Ubuntu 14 bootable USB my 16GB drive shrinked to 2MB. I use HPFormattingTool in windows to recover. You should also add this line at the end before 'exit'. This makes sure it is formatted to use right away. COOL! I've had this "protected" 4GB USBdrive sitting on my desk at work for the past couple of years - numerous attempts to wipe it for reuse have failed... Until now! I now have an extra (usable) 4GB USB drive. Thanks! You can also do a low level format on your usb stick to free up any space that's not accounted for. You can also do this with graphical tools like Gparted on linux, disk manager on windows, and disk tool on Mac.